Frisk Flugt, Floatonomy (Sea of the free) & Floatonomy (Healfleet), 2018, lithography, each 18" x 24". 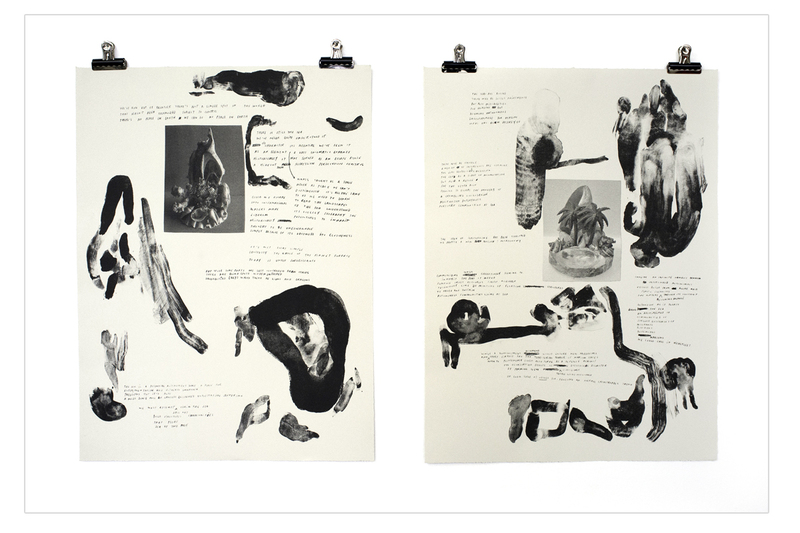 Printed by Pudy Tong under the auspices of the Open Studio Visiting Artist Residency Program. Frisk Flugt, Floatonomy (Element), 2018, screenprint, 47" x 47". 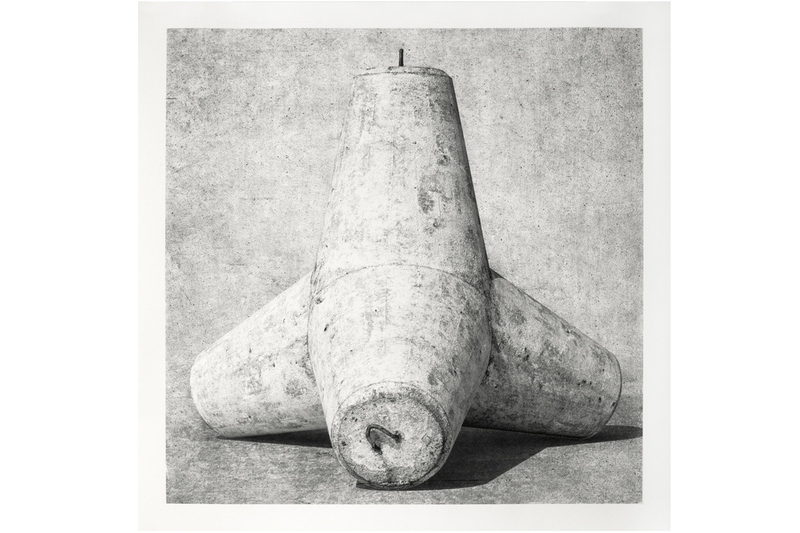 Printed by Pudy Tong under the auspices of the Open Studio Visiting Artist Residency Program. 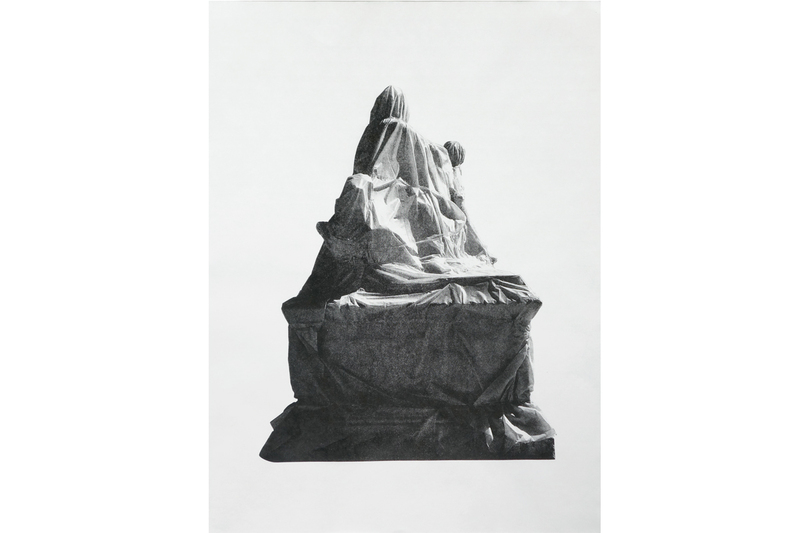 Erika DeFreitas, to bestow / to absorb (back), 2019, photo-lithograph on kozuke paper, edition 1/8, 25” x 18.5”. Printed by Pudy Tong under the auspices of the Open Studio Visiting Artist Residency Program. The second of two Visiting Artist Residency exhibitions in 2019 will feature work by artists Erika DeFreitas & Frisk Flugt (Tina Helen – visual artist and Ask Katzeff – writer). It was in the way the figures were suggested. Draped in, then bounded by. Cloaked. Held. Shrouded. No holes cut out for the eyes. No breaths drawn, hollowing Os where the mouths might be. Postures outlined by pleats and puckers. It would seem still if not for the shadows and the gravel. Dust marking the tips of toes and narrow hems. Its scale unfair. Such a peculiar positioning. To be placed where it cannot be climbed and where no amount of leaning would stir it. It was curious, this thing. All at once, an object, a gesture, a scene. Erika DeFreitas’ photographs of these wrapped figures were translated through the photo-lithographic process, where she then chose to position them as a score. With each reading, these images prompted an action, resulting in a performative, photographic, and text-based response¬ from DeFreitas. Erika DeFreitas is a Scarborough-based artist whose practice includes the use of performance, photography, video, installation, textiles, works on paper, and writing. Placing an emphasis on process, gesture, the body, documentation, and paranormal phenomena, she works through attempts to understand concepts of loss, post-memory, inheritance, and objecthood. DeFreitas’ work has been exhibited nationally and internationally. She was the recipient of the TFVA 2016 Finalist Artist Prize, the 2016 John Hartman Award, and long-listed for the 2017 Sobey Art Award. DeFreitas holds a Master of Visual Studies from the University of Toronto. entanglements and utopian potential. It brings together notions like seasteading, migration, ecology, governance of flows, an d climate change. The sea has always been an unpredictable domain, full of both danger and adventure. Through time the sea has served as a thoroughfare, as a wild common, an escape for people fleeing oppression and war. Today the seas are changing. Ocean currents are slowing down, sea levels are rising and new geopolitical struggles are forming at sea. This of course is posing a host of problems but also offers possibilities – possibilities for new (geo)political configurations beyond nation states, new ecologies, possibilities for setting out to sea experimenting with new floating life forms. The exhibition Floatonomy, produced for Open Studio in Toronto, comprises a series of prints (produced at Open Studio), photographic work and written notes that all deal with the relationship between ocean and shoreline – be it the circular one around the island, the vertical one between water level and shoreline, or the horizontal one formed by concrete embankments – and the dream of floating outside the lines drawn up by authorities. 2014 published several zines, created solo exhibitions at New Shelter Plan (2015) and Hospital Prison University Archive (2018) and contributed to various international publications.